When it comes to suspension, DT Swiss doesn’t enjoy the same recognition as its American counterparts. Given recent victories in both the XCO World Championships and in the 2016 Rio Olympics however, maybe it should be. Released earlier this year, the R 414 is the latest shock design from wheel and suspension specialist, DT Swiss. 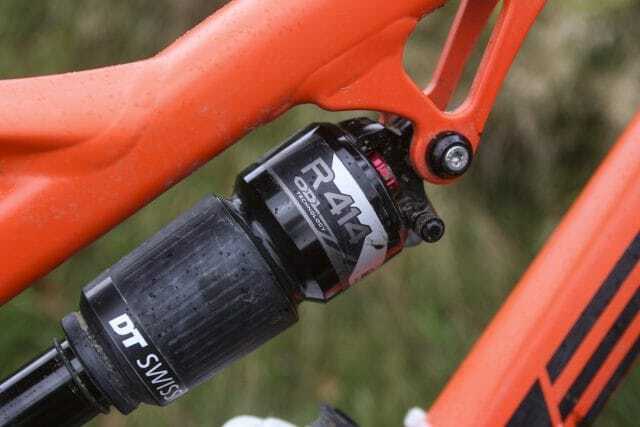 Intended for full suspension XC/trail bikes with 100-140mm of travel, the R 414 differs from other DT Swiss rear shocks in its use of DT’s own Liné-Air design. 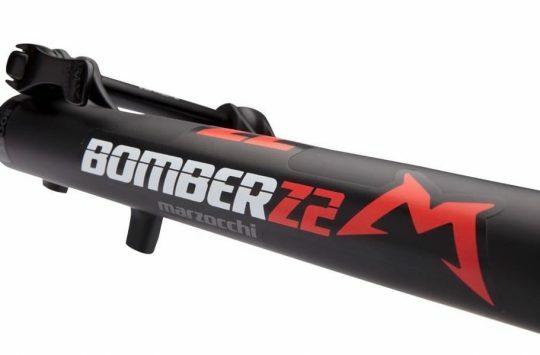 This is characterised by a visually oversized air canister that has a much larger negative spring volume, not unlike the DebonAir design from RockShox, and the EVOL air sleeve from Fox Racing Shox. As with those designs, the Liné-Air system aims to deliver greater small-bump sensitivity, with more support through the mid-stroke. 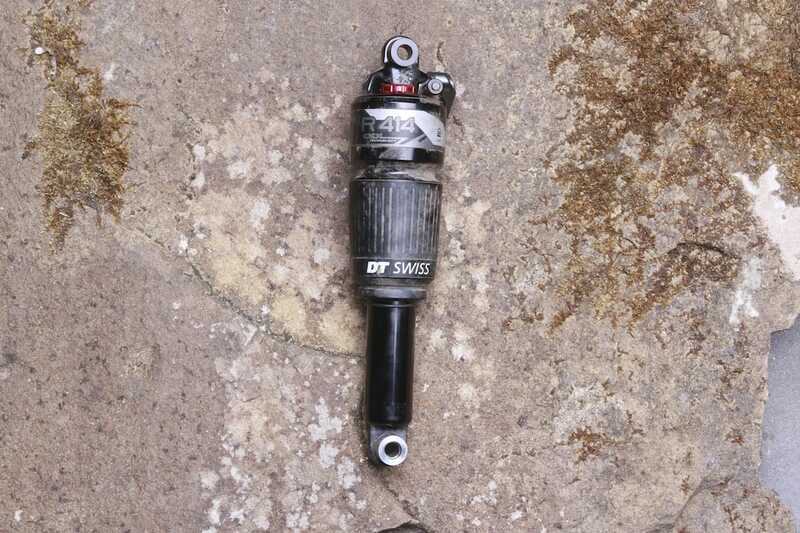 The improvement in on-trail performance was enough for both Jenny Rissveds and Nino Schurter to chose the R 414 over the lighter R 313 shock to win their respective Olympic Gold medals. 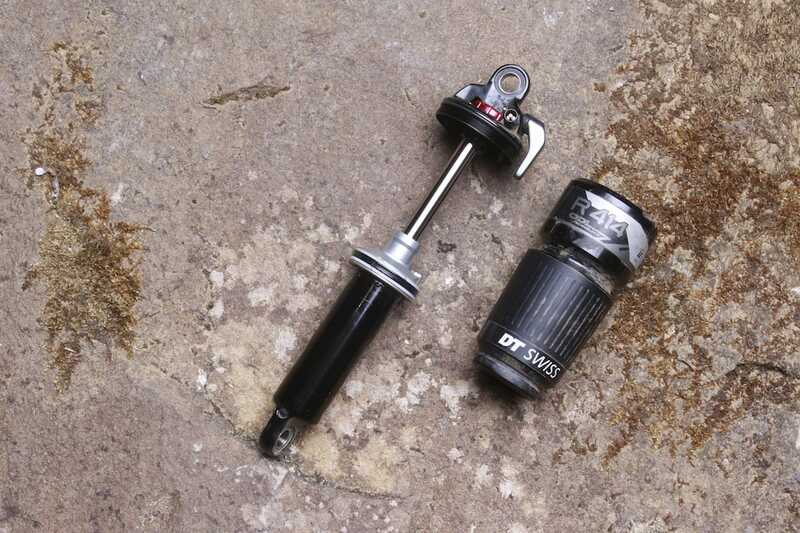 At £329, the R 414 shock comes in cheaper than its big-name competitors, which includes the Fox Float DPS Performance Series (£349), the RockShox Deluxe RT3 (£389) and the Fox Float DPS Factory Series (£479). 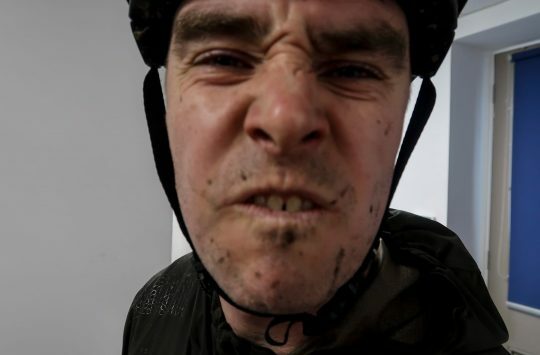 Price aside though, what’s it actually like to ride? The R 414 is DT Swiss’ brand new rear shock. Using the Liné-Air design, the R 414 is designed to go head-to-head with the Fox Float DPS and RockShox Deluxe RT3 shocks. 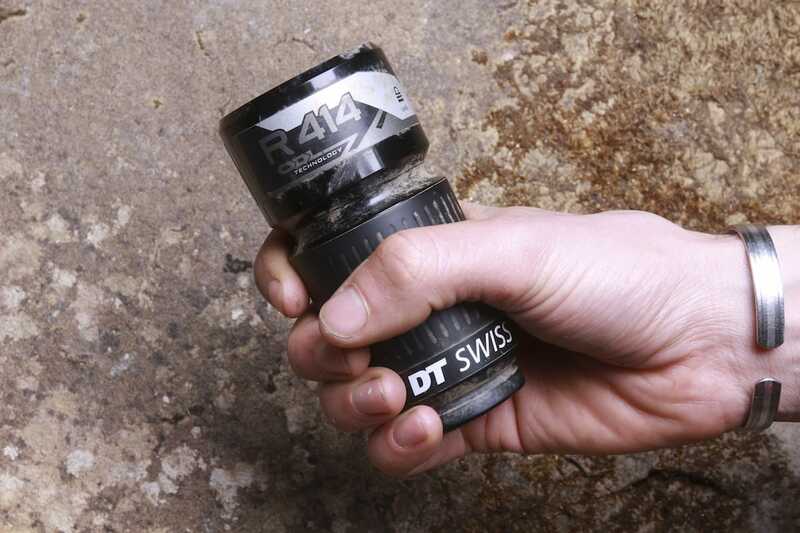 DT Swiss currently offers the R 414 shock in six common sizes, with 165x38mm being the smallest and 216x63mm being the largest. Metric sizes aren’t available just yet, but expect those to join the line in Spring ’18. Like DT’s other shocks, this one mounts up via spherical ball bearing eyelets instead of DU bushings, which creates a rose joint to offer a little bit of wiggle room to reduce side loading on the rear shock for improved longterm durability. This flexible mount does mean that the R 414 shock won’t work with suspension designs that have one of the eyelets rotated 90°, like the new Whyte S-150, or Lapierre’s previous Zesty models, and Kona’s original Process. Otherwise everything else is pretty straight forward. 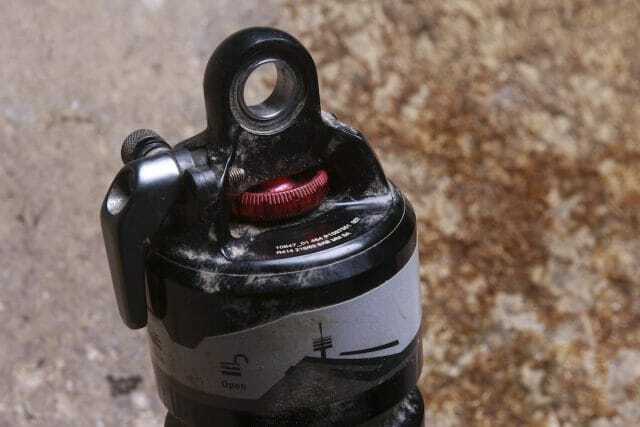 There’s a single Schrader valve for inflating the air spring, a red in-line rebound adjuster, and a grey metal lever that flicks between three pre-set compression settings: Open, Drive, and Lock. There are Open, Drive and Lock settings. Bolted onto our Whyte T-130 longterm test bike, the R 414 shock replaced the stock RockShox Monarch RT, and I’ve been testing the DT unit for just over five months now. I initially set it up with 150psi of pressure to get me 25% sag. A few bounces on the saddle is required for the positive and negative air chambers to equalise, so it’s worth doing so then re-checking the sag amount each time you adjust pressure. The rebound dial provides a huge range of adjustment – I counted 38 clicks in total. After some early carpark poppin’ and hoppin’, I set the rebound dial halfway, and got myself onto the dirt. You’ve got 38 clicks of rebound with that red dial. 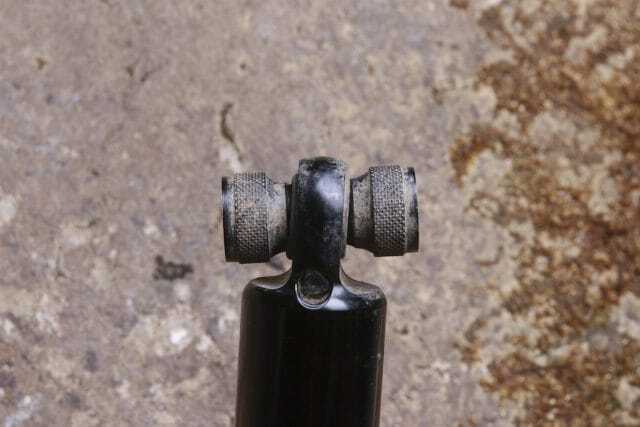 Note the shock eyelet that uses a spherical bearing instead of a traditional DU bushing. My immediate reaction to the R 414 shock was that compared to the Monarch RT, it wasn’t quite as plush. With a slightly firmer feel across knobbly rocks, the R 414 felt like it had a little more compression damping that was helping to keep the T-130 riding higher in its travel. This extra support kept my spinning cranks further away from pedal-grabbing ruts, and was providing noticeably better all-round pedal efficiency, but I was definitely feeling more of the vibrations from the trail surface. In search of more suppleness, I dropped the air pressure down to 145psi, then down to 140psi, which brought sag up to the 31-32% mark. And after speeding up the rebound two clicks, I left the shock settings for the duration of the test period. 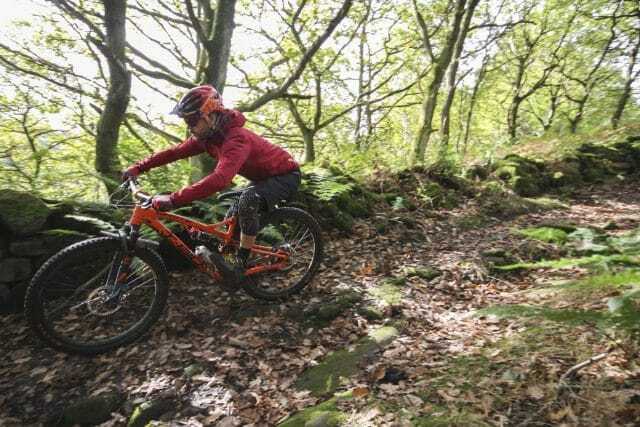 We’ve been testing the R 414 on a Whyte T-130 for the past 5 months. The big shock sits well with the low-leverage design of the T-130’s four-bar suspension design, which averages out to 2.06:1 for the 130mm of travel. I’ve evaluated this shock with its stock off-the-shelf tune, though much like other suspension brands offer, the shock can be custom tuned, should you be searching for a particular ride quality. There’s a really nice and consistent feel through the travel, with the R 414 providing excellent support through the mid-stroke, flattening out the suspension curve a touch so it feels less ‘hammocky’. This can often be the risk of pairing big-volume air shocks with bikes like the T-130, which combine to offer great sensitivity, but with a wallowy feel as your weight pushes down through the suspension. Not so with the R 414 though. It isn’t what I’d call buttery smooth, but what it lacks in small-bump response, it more than makes up for in its composure on mid-speed chatter and high-speed wallops. There is excellent bottom-out support for both surprise hits and for accommodating my awkward landings, and it was only ever the shock’s O-ring position that alerted me to the use of full travel. The R 414 provides excellent mid-stroke support, and impressive bottom-out control. Inside the R 414’s damper, there are four separate damping circuits that use a pyramid-array of thin 0.01mm metal shims. There’s high and low speed compression, and high and low speed rebound. 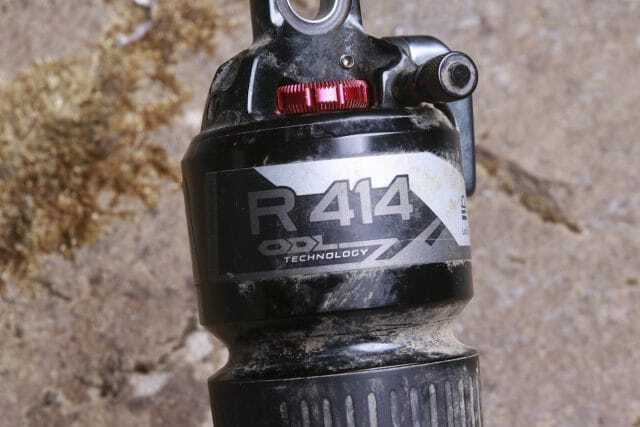 This means there’s a specified oil path depending on the task at hand, which goes some way to explaining the R 414’s well-rounded performance. The external compression lever only affects the low speed circuit, so even if you’re in the Drive or Lock settings, there’s a blow-off function built-in that allows the shock to move if you hit something hard enough. I only ever used the very-firm Lock setting for riding on the road and on the canal tow path, but otherwise kept the shock wide open once I was off-road. The Drive setting is likely useful for XC race bikes and/or climbing on smoother bike-park type terrain, though I personally found the damping to be too firm in this setting, so I just left in Open. After all the much this shock has been through, it’s pleasingly clean inside. Aside from the external adjustments, there is further tuning available once you delve inside the R 414 shock. There are no volume spacers as stock, but I’m told they can be fitted to reduce volume and increase progression. 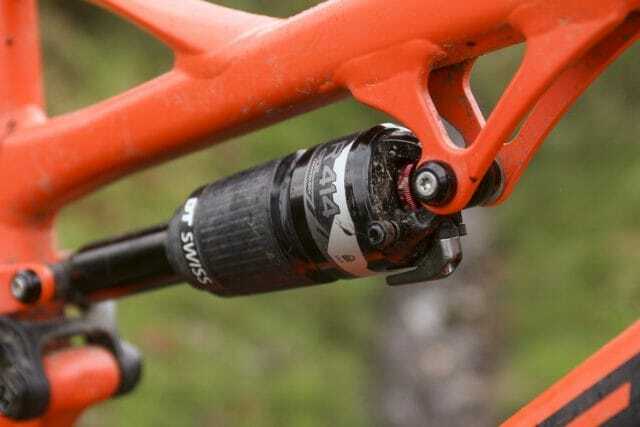 Unlike Fox and RockShox however, DT Swiss isn’t too keen on riders doing this on their own. According to DT Swiss, the stock spring and damper setup should be suitable for a wide range of riders and bikes, but if you really need to adjust volume (if you’re regularly blowing through the travel), then you’re going to need the damping tuned at the same time. TF Tuned is the authorised UK service centre for DT Swiss, and it can handle any such custom tuning requirements. The machined grooves in the air can make unthreading a breeze. Routine servicing is a much simpler affair, with DT Swiss recommending that you service the air can every 100 hours for regular riding, or as frequently as every 40 hours if you ride in really filthy conditions. This service simply requires you to depressurise the shock, unthread the air can (which is ingeniously textured so this can be done by hand), wipe the internal surfaces clean, and re-lube with 3-5cc of its own Panolin lubricant, or something like Fox Float fluid. You can find the full service details here. The bearing eyelets help to prevent frame flex from twisting the shock body. For a full service of the damper and IFP, DT Swiss recommends a monstrous 200-hour service interval, which is one of the longest we’re aware of for any suspension product. That’s impressive, and much of the brand’s confidence in its own product comes from spec’ing high quality internals including a super hard piston coating, along with those spherical ball bearing eyelets that help to minimise physical flexing and twisting of the shock body. In an ideal world all frames would be stiff (and aligned) enough to eliminate any side-loading on the shock, but that isn’t always the case. 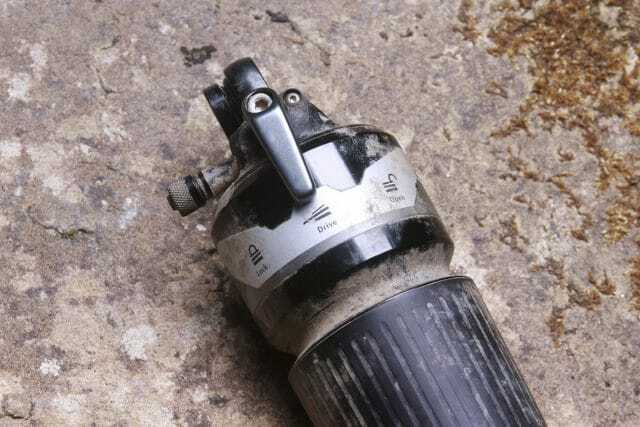 If you’ve ever seen a rear shock with visible wear on the stanchion’s coating, a twisty frame/linkage is the likely cause. And while I’d need another 12 months of testing before I could evaluate the R 414 shock’s true longterm durability, at least in theory those spherical eyelet mounts should do the trick, with the goal of improving general wear and tear. So far I’ve got no reason to doubt DT Swiss’ claims. With its high quality fit and finish, the R 414 shock is a compelling option. The R 414 is a bit of a sleeper suspension product. Though given its victories on the world stage and the quality evident in its measured design, this is a shock that should be on more riders’ radars. It’s made well, comes with very generous service internals, and is competitively priced relative to the competition. It doesn’t offer the most supple performance, so look elsewhere if you’re after a melty, hoover-like feel to your rear suspension. Personally we’d like to see a user-friendly option for adjusting volume, but if your preference is for consistent suspension action that delivers efficiency at the pedals with usable mid-stroke support and end-stroke control, the DT Swiss R 414 shock delivers. Win these HT T1 Pedals and pedal Like Jerome Clementz! It's Day 19 of our Advent Giveaway! I’ve got an upgrade itch. I have been struggling with mid support on my T130, even after adding a couple of volume bands. I was intrigued to read about the extra support that you say this shock provides. I’m currently running 180PSI in the back to achieve 30% sag. For most riding this feels fine, until I try and sprint out of the saddle, at which point the bike starts to wallow in the mid stroke, soaking up all my efforts. I suppose one option would be to add more spacers and drop the pressure to try and make the shock more progressive. I would grateful to hear your opinion. @potiriadis – That’s a very good question! Are you able to use all of your travel at the moment? Or are you bottoming out regularly at your current 30% sag point? Oddly, I found mine to be more supple than the stock Monarch in my Hightower. I regularly find that I am using all of the travel, rather than bottoming out, but I do feel the bike sits too deep into its rear travel when pushing on seated, resulting in regular pedal strikes. The flip side is that the bike is like a steam roller on descents, just point where you want to go and release. At the moment I have bike set up for 30% sag front and back when in the “ready position”. To be clear, these are very much first world problems, and I love the bike, I’m just considering if I could get even more out if it. 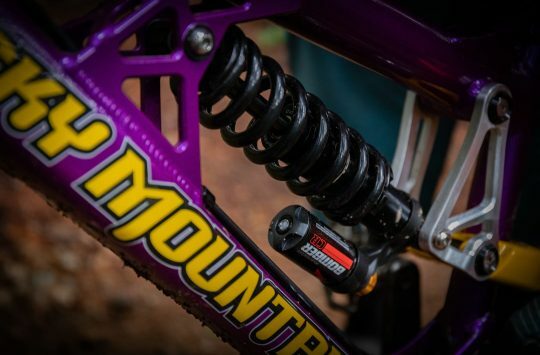 My daughter has the model down which comes with the three position compression damping fox rear shock, and I wonder if what is actually missing is an intermediate compression damping setting rather than the closed and open settings currently available on the Rock Shock unit? She certainly doesn’t get the foot strike issues I get, but she also has the benefit of being half my weight. I went to one of these from a Kashima Fox. I found that the big negative spring tended to generate more sag at the same pressure but when I pumped it up to get the same 25% sag I was used to on the Fox I wasn’t getting anywhere near full travel. When I dropped the pressure and went to roughly 33% sag the shock kinda ‘woke up’ by leaning a bit harder on the more supportive mid-stroke damping I regained a lot of small bump plushness but the bike still didn’t feel wallowy, a really nice balance in fact. Obviously YMMV depending on you bike’s spring curve but so ar, so good.